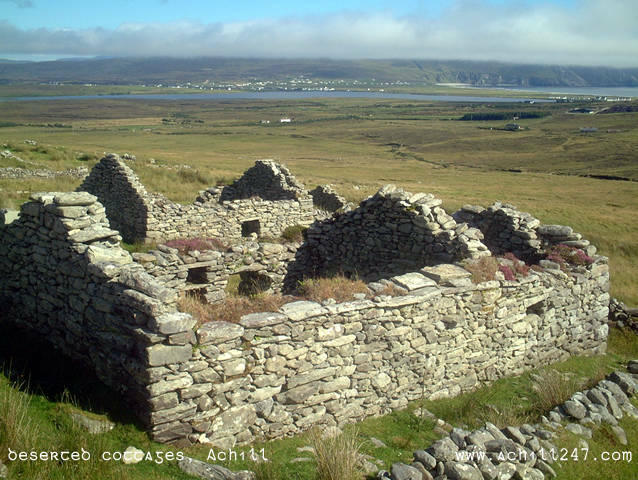 In the 1990s an archaeological project was commenced at the deserted village, Slievemore, Achill Island. The project aims to survey the village remains and the fields surrounding it, which still bear the imprint of the 'lazy bed' system of cultivation. Each year a summer school is held as part of the project. Full details on this fascinating project can be found on the Achill Field School web site. The picture below shows a typical cottage layout at the deserted village, Slievemore, with the larger room at the north end of the building and a much smaller room at the southern end. In the distance can be seen Keel lake, Dookinelly village, Trawmore strand and (covered in clouds) the cliffs of Minaun.